So far 70 school children and others were benefited on the occasion. 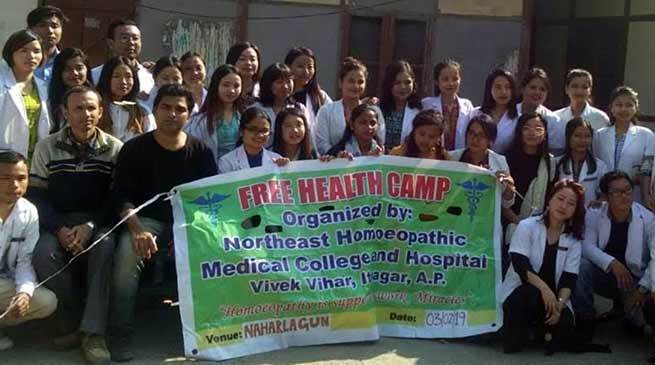 The North East Homoeopathic Medical College & Hospital (NEHC&H ), Itanagar today organised free medical and health camp at Oju Welfare Mission here today. NEHMC&H Senior Medical Officer Dr. Asadul SK inform that the college today organised the medical and health camp here as we have been doing such in various parts of capital complex, district and other parts of state. this is the 1st camp of the year and such camp will be organised in rural area of the capital district soon. He inform that apart of health check up we have provided medicines free of cost to the students of the Oju Mission and other nearby people those who turned up to the camp. As a gesture to the small school Childers we have provided few warm clothes, games and sporting items and school stationary to the children. He further inform that Dr. Bubli Gupta, Dr. Nangdek Taidong, Dr. Aditya Lamgota, para medical staffs and 30 students and internee of the college take part in the camp.